I lived in Singapore for years, and had no idea! Wikipedia article: Singapore Dollar. The one dollar coin is inscribed with an octagon, which looks like a ba gua. Some Singaporeans believe that the government had consulted Feng Shui practitioners and designed the coin thus in order to give every Singaporean a lucky charm. The bagua (Chinese: 八卦; Pinyin: bā guà; Wade-Giles: pa kua; literally "eight trigrams") is a fundamental philosophical concept in ancient China. 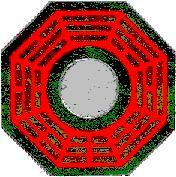 It is an octagonal diagram with one trigram on each side. The concept of bagua is applied not only to Chinese Taoist thought and the I Ching, but is also used in other domains of Chinese culture, such as fengshui, martial arts, navigation, and so on.